Make all the lights go away in this incredibly frustrating iPhone game. Lights Off is one of the iPhone's most annoying apps. 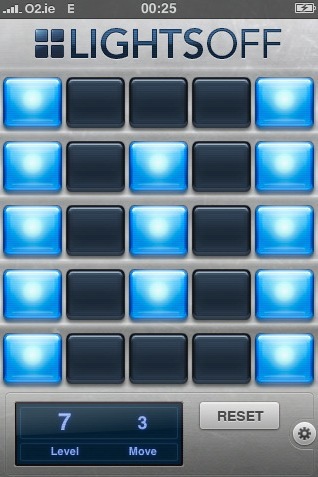 A puzzle game inspired by Tiger Electronics' Lights Out, it challenges you to turn off all of the lights on a 5X5 grid. Although it seems to have lots of fans, we didn't have the patience to deal with it. Each puzzle features a certain amount of illuminated lights and it's your job to put them out. To do this, you press one of the lights and wait for one of two things to happen: either the lights go out, or they go out and new ones come on. The trick is figuring out which squares to press in the least amount of moves. Things get hairy if you randomly press the squares. Eventually, you'll be unable to retrace your moves and return things back to the way they were before you started. This is what ultimately drove us batty. After failing to switch off the lights in less than five presses, frustration set in and we just started poking the screen. It's easy to see why people like this game so much, especially because it forces them to memorize patterns to solve the puzzles, but we couldn't get into it. At $1.99, Lights Off may appeal to you. For us, it was more like "Game Off". What's Hot: Lots of puzzles to solve, decent touch screen controls. What's Not: Drives us nuts, gets boring.